If you want to increase your email subscription rate and take your business into the the NEXT level, then here's a good news for you. MaxBlogPress is giving you an ACCESS to full functional Subscribers Magnet - their List booster wordpress plugin for just $1. for you to give it a try and see how cool it is. Grab your readers attention to subscribe in your email list by placing optin form anywhere within post. Place your optin form at sidebar, giving your readers flexibility to sign up. 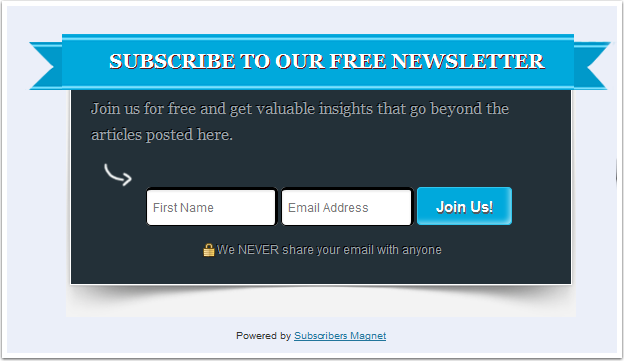 Make your readers easier to subscribe in your email list by just clicking on the checkbox. Grab your readers attention and increase your email signup rate by displaying the Popin in your blog. Display optin form in your footer bar without irritating your readers. Automatically subscribe the commentators to your autoresponder when they make their first comment. Convince commentators to join your newsletter by displaying optin form right after submitting their comment. Send personalized message to your readers when they comment on your blog, encouraging them to revisit your blog and eventually subscribe in your email list. * Track how many impression your optin form received. * Track how many visitors turned into subscribers. * Track individual optin form stats. * Track which optin form is bringing you more subscribers. The lasttest version is compatible with the lastest version of WordPress, life free upgrades of the new version, peer to peer community surport and free any email suport if you have any problem with the plugin or need any help. Now, you can get 14 day-trail only $1 for single-site license or mutisite license. You can visit Cou-pons.net blog for mor coupon codes.